We are capable of shipping one hundred thousand pairs of socks to more than one thousand different shops in approximately 5hours. Our task ends with shipping flawless socks in accordance with clients' order. Even if we receive shipping request that distribution specialists can not handle, we have developed system that responds to urgent orders within our company. Our system is capable of responding to shipping request that asks for speed, large quantity and difficult categorical sorting. To accomplish this, always revisions are made in acceptance of raw materials, movement of goods within the company, item picking, inspection and shipping. The wave picking is suitable for large orders, which is heavily dependent on machines and computers. On the other hand, the batch picking method relies much of its process on human hands, which is well known for its performance in picking small and complex orders. We often use several kinds of methods or combination of various methods. 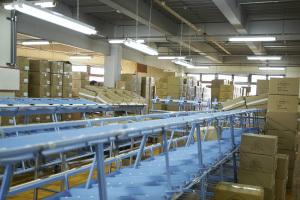 Establishing original distribution process and customizing logistic warehouse machine are our strong appeal points. This enables us to ship large quantity of socks - inclusive of small and difficult sorting - to clients in short period of time. "The original distribution system? ", " picking layouts ? ", " equipments used? ", these are the questions we are often asked from logistics and distribution specialists. These elements and source of ideas are originally discussed and shared from our employees. The solidarity within employees creates speed and reliability in the distribution system. One of the most important process in packing and shipping is the metal detection. Because it is more efficient and reliable to carry out this process by hands, we use man power to complete this process. For the safety of consumer, each single pair is examined carefully one by one.